12.5" RCOS @ ~f/9 (2880 mm fl) 0.64 arcsec / pixel. The Zoomify image scale is 0.64 to 2.86 arcsec / pixel. CCDSoft, CCDStack, Photoshop CS3 w/ the Fits Liberator plugin, Noel Carboni's actions. eXcalibrator v3.0 (g-r) color balancing, using 66 stars from the SDSS-DR7 database. 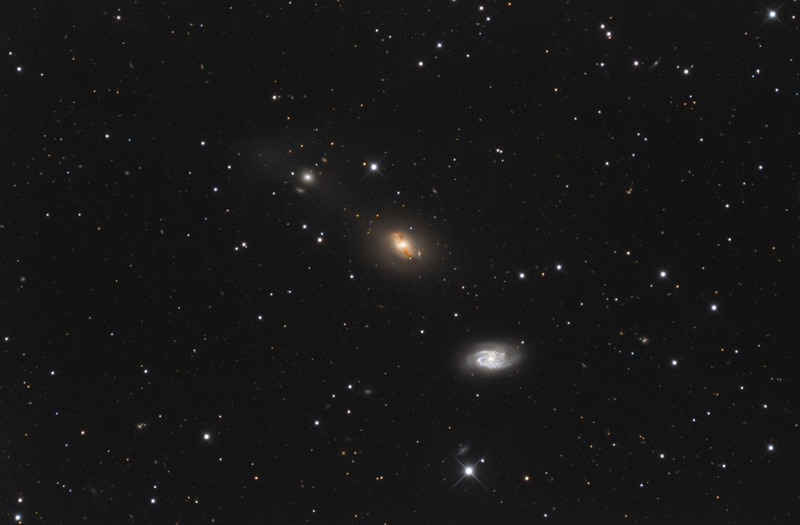 From left to right these three galaxies, in the constellation Leo, are NGC 2970, 2968 and 2964 and are at the respective distances of 84, 81 and 71 million light-years. NGC 2968 and 2964 are possibly a pair, while the interactive association between NGC 2968 and 2970 is clearly indicated by the connecting bridge. The image contains 1470 background galaxies, to magnitude 22.7. Additionally, the image has one QSO at redshift 1.79.